Irrfan Khan-starrer Hindi Medium may have released at a time when big-scale movies such as Baahubali 2, Dangal are creating a storm at the box office, but it is still managing to impress critics and also remain profitable. 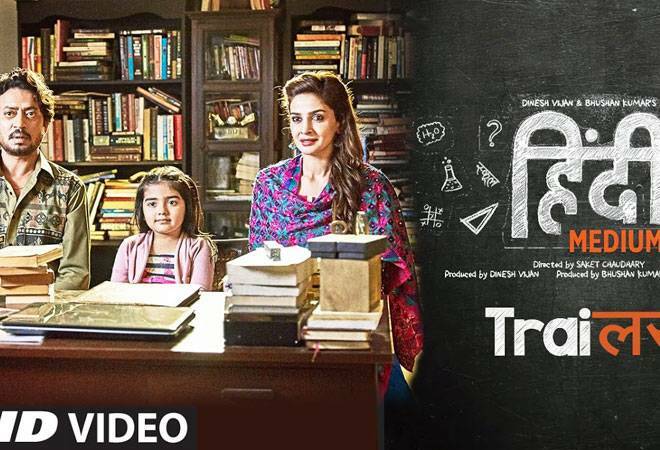 Irrfan Khan-starrer Hindi Medium may have released at a time when big-scale movies such as Baahubali 2, Dangal are creating a storm at the box office, but it is still managing to impress critics and also remain profitable. The movie made at a low budget of Rs 22 crore has already earned Rs 25.21 crores at the box office. This amount is over and above Rs 15 crore it had recovered through satellite, music and other rights. On Day 7, the film raked in Rs 3.10 crores at the box office. Hindi Medium on its day one had collected Rs 2.81 crore. The film has already collected almost 10 times the Friday number, which could mean the film has benefited from word of mouth and good reviews. #HindiMedium Fri 2.81 cr, Sat 4.25 cr, Sun 5.50 cr, Mon 3.15 cr, Tue 3.30 cr, Wed 3.10 cr, Thu 3.10 cr. Total: â‚¹ 25.21 cr. India biz. The subject has been critically acclaimed and the fans are loving the chemistry of Irrfan and Saba. A couple of days ago, Irrfan Khan took to twitter to share his happiness over the response his film was receiving. India Today's Samrudhi Ghosh praised actor Irrfan Khan in her review of the film. "If you look at performances, Hindi Medium is a winner. Irrfan, usually seen as a serious actor, shows that there is nothing he cannot do justice to. He effortlessly makes you laugh as the tailor's-assistant-turned-mega-tycoon trying to fit in with the old money crowd. Saba Qamar is Pakistan's finest export so far, and excels as the Chandni Chowk girl with social climbing aspirations," she wrote. Alongside Hindi Medium, Half Girlfriend is also doing well on weekdays and the film has already collected Rs 49.19 crore so far. Half Girlfriend collected Rs 3.56 crore on Thursday. For Half Girlfriend, the trolls seemed to have worked in favour of Arjun Kapoor and Shraddha Kapoor film. After all, no publicity is bad publicity. #HalfGirlfriend Fri 10.27 cr, Sat 10.63 cr, Sun 11.14 cr, Mon 5.11 cr, Tue 4.46 cr, Wed 4.02 cr, Thu 3.56 cr. Total: â‚¹ 49.19 cr. India biz.